A couple of months ago I produced a Eyebrow series which outlined ways to achieve HD Brows at Home . 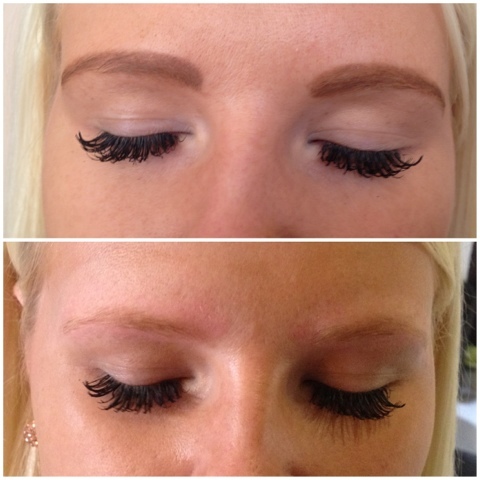 Today my post is about Eyebrow tattooing and achieving the perfect brow all year round. Eyebrow tattoos and cosmetic make up have become very popular lately with celebrities, and now women are looking at this option as a way of filling in over-plucked brows or a way of adding definition to the face if they have lost their brows due to medical reasons. In the 90's I can remember wanting super thin brows and majorly over-plucking them to achieve this look,(thank god they grew back) but recently fuller, thicker brows are more fashionable and people are now filling them in and resorting to HD brows to conform to the current trend. 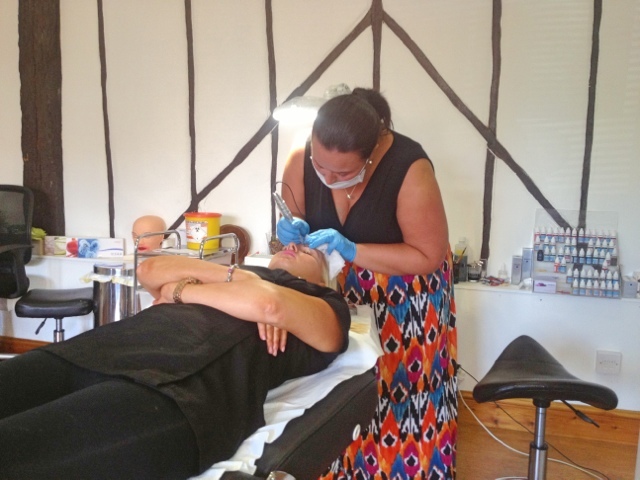 I went along with my friend Chelsey to see our local cosmetic tattooist Susie Bavister. Chelsey has naturally fair eyebrows ( as you can see from the bottom picture above) and is allergic to tint which means she has to powder and draw them in everyday ( above picture of how Chelsey normally wears her brows). They're a bane of her life and she has been considering eyebrow tattooing for ages, she finally plucked up the courage to get them done and I was there to offer her support and see what the treatment entails. 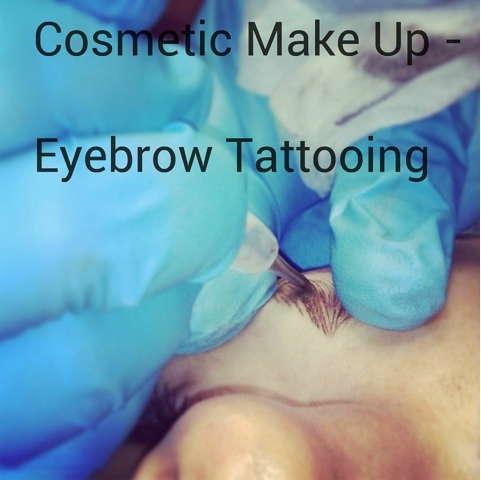 Cosmetic tattooing and semi permanent make up is very different to normal tattooing. A regular tattoo artist will use ink to perform his tattoo with a longer needle whereas a cosmetic tattooist will use pigment and only penetrate the top dermal layer of skin, making it semi permanent. The pigment fades over time as we shed our skin. Some clients have them re- touched every 9 months or so, but most commonly the procedure is performed annually to maintain the shape and colour. 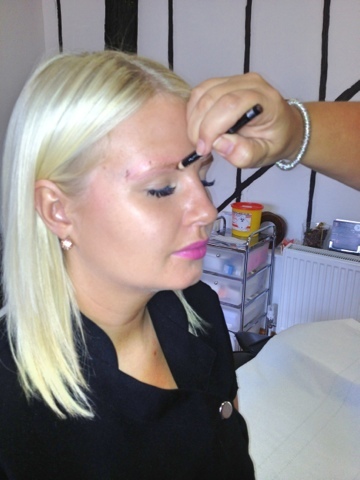 Before starting the treatment Susie placed some numbing cream on Chelsey's eyebrows as they had their consultation. The numbing cream takes about 20 minutes to start working, so Susie used this time to get Chelsey to fill in her medical questionnaire and chat about the desired shape and colour that she wanted. To help determine the right shade that would be perfect to her colouring Susie swatched different shades of brown pigment on Chelsey's forehead to get a better understanding of what the colour would look like with her hair colour and skin tone. 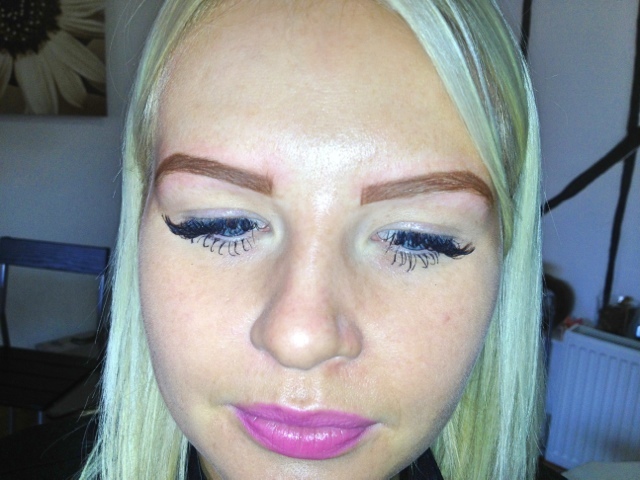 Chelsey likes her eyebrows quite dark so Susie opted for a medium/dark ash brown. After the shape had been decided it was time for the tattooing to begin! Fine lines to mimic hairs were brushed on using an ultra fine needle. 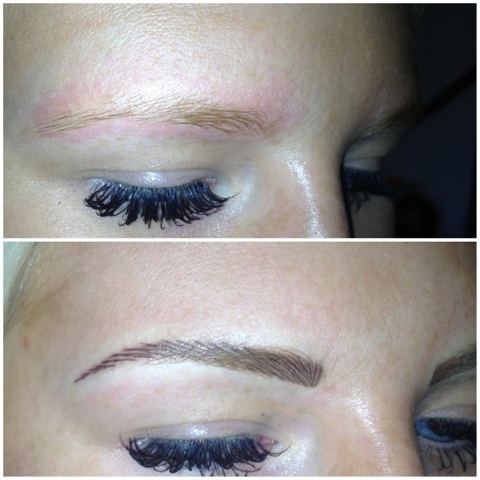 Susie started off by tattooing the outline of the brows first, she then moved on to the next brow, placing more numbing cream on the first brow and covering it in cling film before starting on the second. This process occurred another 3 times on each eye, more tiny hair like strokes were drawn to fill in the outline that she had created. I was surprised at how quickly the process took. 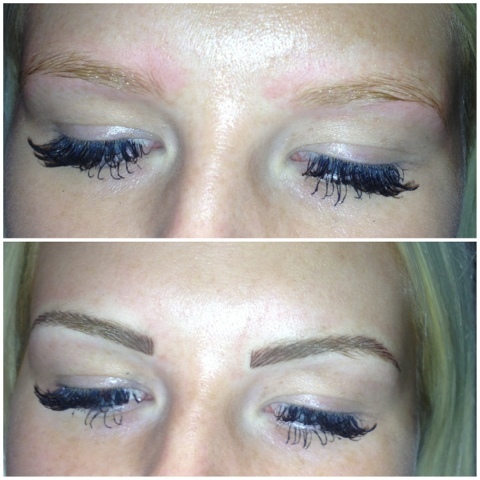 The treatment minus the consultation period was only 45 minutes and Chelsey was left with perfectly symmetrical eyebrows. I asked her what it felt like and whether the treatment was painful and she said it was a similar sensation to having your eyebrows threaded, some sections were a little more painful then others but all in all it was nothing that she couldn't handle. Chelsey was delighted with the result and a follow up appointment was made for 4 weeks time. Susie explained that she could lose up to 40% of the colouration due to the body rejecting the pigment (which is normal) and she would need a touch up, after this she will only need to come annually to maintain the shape and colour. The treatment costs £250 and her annual treatment cost will be £125, I think this is a brilliant price for perfect eyebrows all year long, no more drawing them in, they won't run or need touching up during the day and best of all you look fantastic first thing in the morning and when on holiday or swimming. 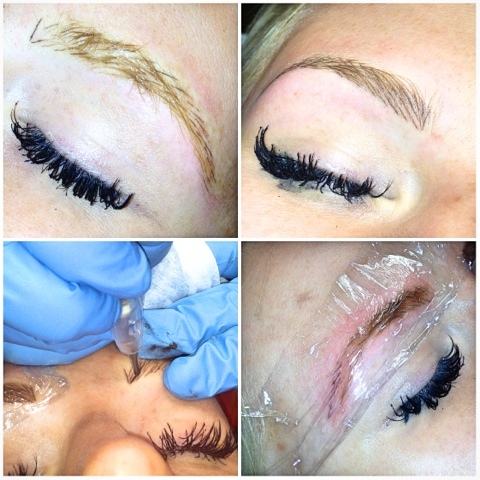 I am considering getting mine done after seeing how great they look on Chelsey! What do you think to cosmetic make up? Would it be something that you would consider doing? I would love to know what you think! Oh she is brave. My tattoos didn't hurt but I can imagine on the eye brows to be a bit stingy. They do look good though, bet she's made up not having to waste all the time filling her brows in any longer. WOW they look absolutely incredible - I've never seen tattooed eyebrows that have looked as realistic and just plain awesome as that before!! I think the key is to get the right colour, nothing too red or orangey in colour, plus you really need to do your research, making sure to look through the tattooist portfolio so you know that try are good. Do not be blindfolded while purchasing cosmetics;Elle MacPherson Skin Cream as you may be handed a product that is filled with harsh, toxic chemicals and acids.